« ATK to get unfunded CCDev agreement? Last month the small community of people who closely follow the NewSpace field expected a test flight by ultra-secretive Blue Origin, based on a Notice to Airmen (NOTAM) issued by the FAA warning of “rocket launch activity” by the company at its launch site in west Texas on August 24. that date came and went without any news, which is not surprising given how the company closely rations information about its activity. Late today came news that the test flight did not go well. The Wall Street Journal was the first to report that the vehicle suffered a malfunction in flight and was destroyed. The initial report indicated that the failure took place when ground controllers lost contact with the vehicle during the flight. The vehicle was either severely damaged or destroyed; “parts of the vehicle were recovered on the ground and are now being analyzed by company experts,” the Journal article reported. An unnamed local official in the nearby town of Van Horn, Texas, claimed in an interview with Forbes.com that some locals saw the launch failure, likening it (with some amount of hyperbole, no doubt) to the Challenger accident. The company disclosed few other details about the vehicle, which is known as “PM 2″ in its experimental permit with the FAA’s Office of Commercial Space Transportation. Bezos did note that they did “a short hop mission” three months ago; that took place on May 6, according to the list of permitted launches on the FAA’s web site (not yet updated to include the August launch failure.) The “PM” designation suggests this is a propulsion module in Blue Origin’s two-stage suborbital vehicle design, with a separate crew module; Bezos notes in a postscript to his statement that “the development vehicle doesn’t have a crew capsule”, only a round fairing. “We’re working on the sub-orbital crew capsule separately, as well as an orbital crew vehicle to support NASA’s Commercial Crew program,” he adds. Some in the media, though, tried to unnecessarily play up the implications of the test flight failure. “The mishap, which industry officials said occurred last Wednesday, dealt a potentially major blow to the ambitions of Mr. Bezos,” claimed Andy Pasztor in his Wall Street Journal article, even though Bezos himself didn’t sound overly concerned in his message. 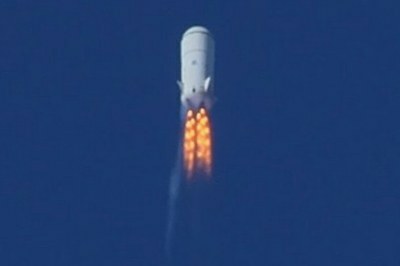 Later, noting that Blue Origin is one of four companies with 2nd round NASA Commercial Crew Development (CCDev-2) awards, Pasztor suggested that “The failure also could set back White House plans to promote commercially developed spacecraft to transport crews to the international space station by the second half of this decade,” even though the test flight did not appear to be directly related to their separate CCDev-2 work, as Bezos also indicated in his note. Separately, the Wall Street Journal published a blog post with the curious title “Rich Guys Have No Luck in Space”. The text of the blog post, though, doesn’t match the headline: some of those profiled seem to have had, or are having, at least halfway decent luck: Paul Allen was successful, for example, backing SpaceShipOne in the $10-million Ansari X PRIZE, while Elon Musk is enjoying some technical and business success at SpaceX after some early launch failures of its Falcon 1. It’s worth remembering that this was, by all accounts, a test flight. And, by their nature, not all test flights are successful: that’s why you fly to, to find problems and correct them. Moreover, the loss of PM 2 is hardly the first time a vehicle has been lost in a test flight, either by a company or a government agency. It’s the nature of aerospace. By Bezos’s account, he sounds ready to move ahead, undaunted by the failure. There’s also a lesson for some in the media as well, to not overreact from a single test failure (or, for that matter, a single successful test). You’re right Jeff, some people don’t understand what the word “test” means. To detractors it means if it’s successful, then “it was only a test”. But if it was a failure, then they are “0 for 0 in launching rockets”. I guess no one remembers all the Apollo failures. Over at HobbySpace Clark has a video of the time Armstrong had to punch out of the “Flying Bedstead” lunar lander trainer – but I guess people hear what they want to hear. At least with successful business people that have deep pockets, these things don’t tend to rattle them. You’re right, Ron, but you’re also wrong. The “flying bedstead” you’re talking about was in fact a completely unsafe lunar landing trainer known as the LLRTV. In effect it was four landing pads, a seat and two Pratt & Whitney jet engines pointed straight down with enough fuel for about 10-15 minutes of flight. Any such VTOLV (Vertical Take-Off & Landing Vehicle) such as this awkward and badly thought out design must be kept in more-or-less a straight up and down alignment. If it pitches more than 5 degrees in vertical alignment then it becomes impossible to recover from no matter how good a pilot you are and Neil was one of the best that ever lived. That day, the starboard (right-as the pilot sits, which was in front of the engines) lost thrust and the vehicle began to pitch beyond the 5 degree mark. Neil was only 60 feet off the ground and with alarm bells going off all over the place (engine warnings and pitch-angle stall warnings), Neil calmly reached over his and pulled the ejection seat handles, which popped him about 30 feet away from the spider-looking vehicle and then floated to the ground some 100 feet from the huge explosion the LLRTV made when it hit the ground. In no way was the LLRTV part of any piece of the actual working hardware in the Apollo spacecraft, so in that point, you’re dead wrong. However, during the “plugs out” test of Apollo 1 on Pad 34 at Cape Canaveral Air Force Station (plugs out refers to no wiring or umbilical tied to the spacecraft to test the APU’s and radio, life support systems, etc. ), Mission Commander Gus Grissom was becoming quite angry that the radio couldn’t even reach the blockhouse when Astronaut Roger Chaffee yelled, “Fire!” over the radio and within a few seconds, all three Astronauts, Gus Grissom, Roger Chaffee and Ed White (the first American to walk in space during the Gemini program) were dead and the investigation found that an access compartment under the seats where a thinly insulated flat wire bundle was attached to the door had been opened enough times that it wore off the insulation so during the test, they had ramped up the pressure in the capsule to 22 PSI (pounds per square inch) to simulate the outward pressure the capsule seals would be exposed to in space (and it was pure oxygen), the wiring sparked and when it hit the pure oxygen it followed all the Velcro through the capsule and ignited the entire pure oxygen atmosphere. The Astronauts were actually dead in 15 seconds from asphyxiation. The capsule itself literally blew apart and since they had removed explosive hatches from all capsules, ironically, since Gus Grissom almost drowned in Liberty Bell 7, his first flight in a Mercury-Redstone suborbital mission in 1961, the men had no way to quickly egress the spacecraft and save their lives. The man who recommended to remove those explosive hatches after Grissom’s unfortunate accident was one of the men assigned to disassemble Apollo 1 and told Astronaut Frank Borman that he wished he had never told NASA to do away with those hatches. He said it was the worst case of irony he had ever heard of in real life and he was never a big fan of irony and then he burst into tears. Now that, my friend, was a failure of the Apollo hardware, but there was never one malfunction in the rest of the program that the astronauts couldn’t overcome, even Apollo 13, which to this day was NASA’s most shining moment when it could have been it’s worst nightmare. The Saturn V booster (which should never have been retired and if it was still in service today we wouldn’t be in the mess we’re in today) never had a failure that caused it to not reach 100% of it’s mission’s objectives. It remains to this day the most reliable booster ever designed, constructed and launched and damn sure was the most impressive I’ve ever seen in my life. I was born and raised in Cocoa Beach, Florida in 1955 so I’ve seen the space program almost from the beginning and it grew up as I did and I’m proud to have lived long enough to have seen the things I did, met the Astronauts that I have and remember the things that I do. Excellent article that puts the incident into perspective. Of course, there was no need for the Challenger comparison. Hyperbolic indeed– Challenger killed seven people. Maybe people don’t understand what test flights are anymore because the Shuttle never had any. Really, it looks like Blue Origin is making good progress, but the case for NewSpace doesn’t benefit from their tight-lipped policy. Actually, it did — around 140 of them — a fact that the mass media, general public, legislators, and even NASA tended to forget. In my opinion, companies like Scaled and Blue Origin are right to keep these highly experimental programs secret until they’re successfully tested and flying. Flight test is hard enough without the overzealous, ambulance-chasing scrutiny of today’s mainstream media.